August 26, 2009 – At Graceland Phuket Resort & Spa, many disease control specialists of World Health Organisation from different countries i.e. India, Sri Lanka, Singapore and Thailand got together in a knowledge exchange seminar about Chikungunya disease control and surveillance which is breaking out all over Asia and Africa. 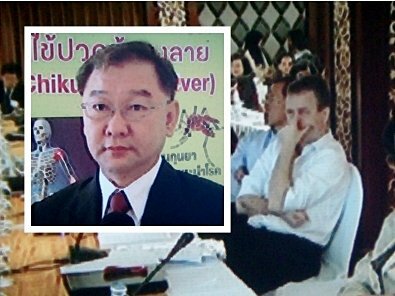 Chikungunya disease has been breaking out in Thailand particularly in the South since 2008. Official statistics from Bureau of Epidemiology since January 1 – August 18, 2009 showed that there were 38,275 people in 51 provinces infected with the virus. However, No death was attributed to chikungunya. Narathiwat Province reported the highest number of infections at 7,780 while Phuket reported at 2,744 patients. Bureau of Vector Borne Diseases, Department of Disease Control was supported by WHO to hold the seminar on August 26-28. Gathering many specialists from many disciplines such as Diagnostic Techniques, Therapeutic Techniques, Entomology and Disease Control and Problem Solving Process the seminar hope the shared knowledge and experience will benefit regional disease prevention.